Base camp was a long hike away from our camp. We had to walk for over 4 hours just to get there. The weather was not what we excepted. It was cold and snowy. Finally when we got there we had lunch in a Peak Performance tent. Everest Base camp was quite empty except for a few tents. We walked around for 30 minutes. We saw lots of rocks and snow. 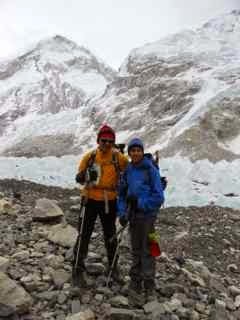 We also saw the Khumbu ice fields. I loved visiting base camp. It was quite an experience that I will never forget.